Snowman in a winter forest on a blue background. 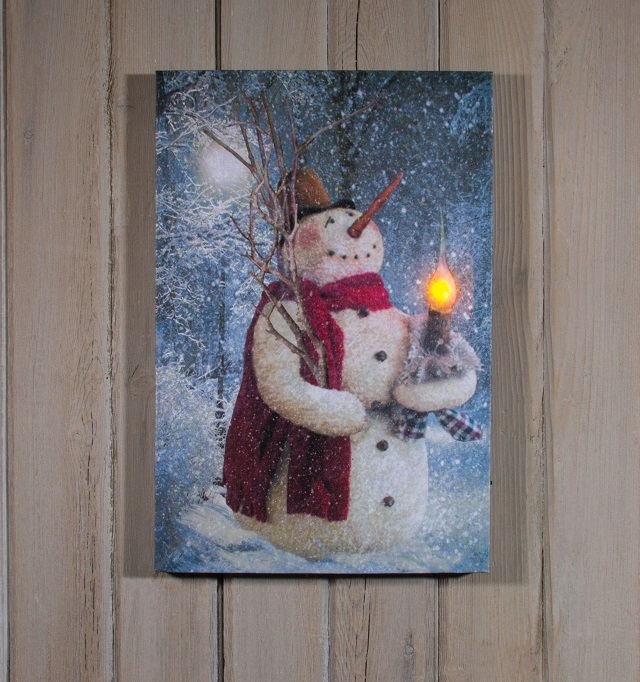 Beautiful winter wall art with the added element of soft lighting. The snowman holds a candle with battery powered lights. The candle flame lights up and flickers like a real candle flame. This is a canvas print over a wood frame with a covered back. Canvas measures 16 5/8 inches x 11 inches x 1 inch. LED lights hidden behind the front panel light up and flicker like real candle flame Radiance Lighted Canvas Collection: battery-operated stretched canvas that features realistic flickering light, much like you would see with actual candle light. Canvas wall art from this collection feature subjects like candles, lamps, Christmas, Halloween and Fall scenes, beach and nautical themes, Billy Jacobs country landscapes and more. Each of the Radiance Lighted Canvas items are operated by 2 AA batteries and, due to the small switch on the side of each canvas, they can be turned on and off without even removing them from the wall. The LED lights draw little power allowing the batteries to last for days of continuous use. An optional Switch It converter is available which will allow you to switch your Radiance Lighted Canvas from battery power to electric power.